@makeupmag! This is what she really looks like! Make-up really can do wonders! French Makeup Artist from Paris, Magali Beauvue can do astonishing things using light and dark foundation – just see for yourself! Below, Beauvue uses her make-up skills and expertise to transform herself into female AND male celebrities. The makeup transformation trend has been going on for a while, but in our opinion, Beauvue definitely stands out from the rest. We actually got a hold of Beauvue recently and asked her all about her make-up transformations. MODERN SALON: When did you start doing your make-up transformations? MAGALI BEAUVUE: “I get a lot of interest about my work on my Instagram @makeupmag. My lip designs get a lot of success and eventually I got featured by Vegas Nay – a famous fashion blogger and make-up artist who brought me a lot of followers. Since then, I have always tried to post pictures about my work. One day, just for fun, I decided to transform myself into a white woman (I am a mix of black and white) and then eventually into a man. I get a lot of positive comments and "Likes". I really have fun doing it! "Little by little I decided to challenge myself and try to transform myself into famous faces. My first one was Michael Jackson. My original inspiration came from Makeup Artist Promise Phan who also did some celebrity transformations as well." MS: Which one is your favorite look? MB: "I like my Snoop Dog and the Game and T.i transformation!" MS: Which one took the longest to complete? MB: "The most difficult was Rihanna because she is too beautiful lol…and I am not happy with the result. I am a perfectionist, so I will do it again until I get it right!" MS: What types of products do you use for each application? MB: "For all of my applications, I only use dark and light foundation and powder. I also use some 'blanc de clown' (an oily base white paint) for the highlights…and I add some eye shadows and black and brown pencil. 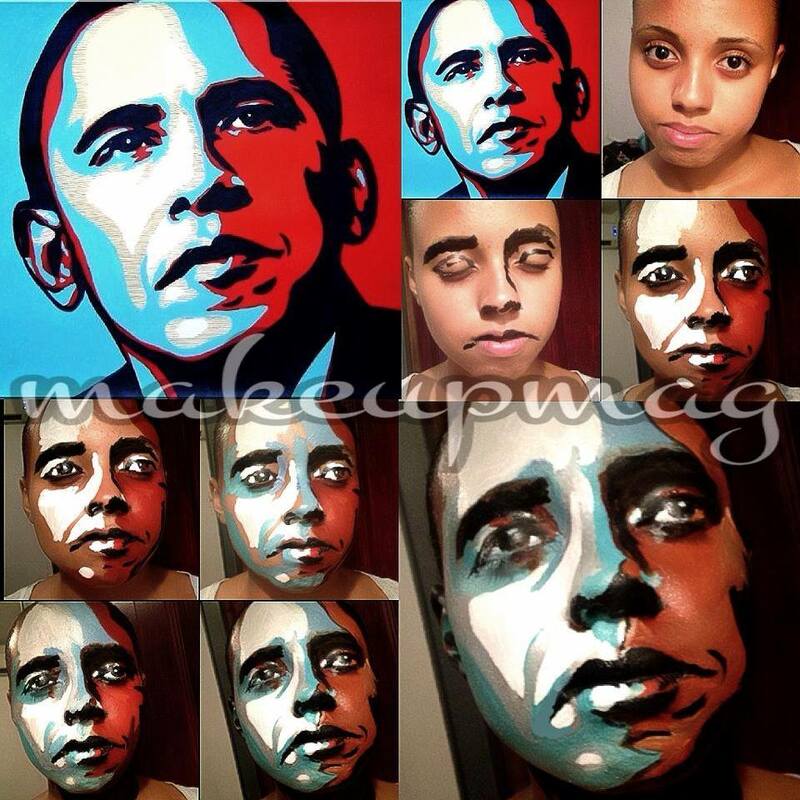 I recently tried to transform myself into celebrity paintings like President Obama! For this technique, I erase my face with a white face painting and I draw on top of it. I have to contour a little but it makes it look more like a painting than a makeup transformation." Who is next on your list of celebrities to replicate? "I am thinking about doing Tyra Banks, Kim Kardashian, Bob Marley (painting version), Brad Pitt, Boris Kodjoe and Josephine Baker."